Only the bravest heroes dare venture to the freezing reaches of the evil Lich King’s forbidding fortress, Icecrown Citadel. The most skilled might even overcome his terrifying undead minions. But when faced with the unholy fury of the Lich King himself, what happens when the heroes fall from the light? What will they do with the immense and terrible power the Lich King offers? Soon it will be time to find out! Rise and harness the dread powers of a Death Knight for yourself when Knights of the Frozen Throne arrives on August 11! The Lich King might be immortal, but this bargain is not! Fortunately, a little time yet remains to pre-purchase 50 Knights of the Frozen Throne card packs for 49,99 EUR/44,99 GBP. Pre-purchase now, and you’ll also unsheathe the chilling Frostmourne card back for your collection. 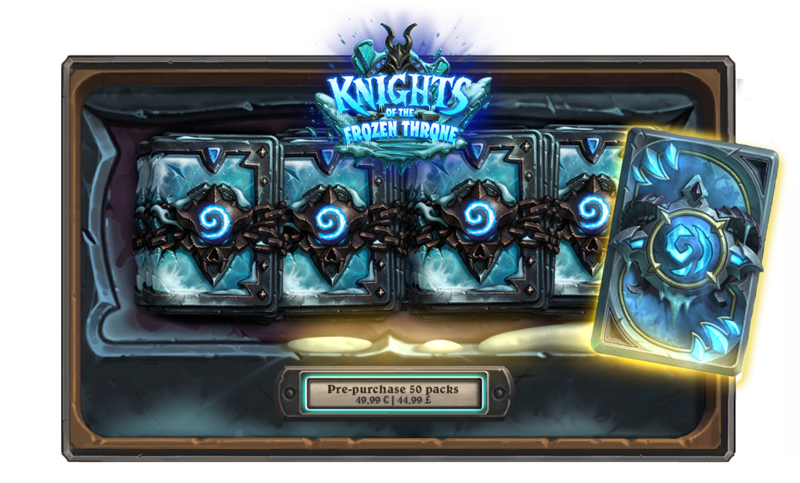 You will receive the Frostmourne card back and your packs as soon as your purchase is processed, and you can break the seal on your card packs once Knights of the Frozen Throne arrives. The coolest party of the year is still in full swing, so don’t miss it! Complete a special Arena quest each week to be rewarded with a Knights of the Frozen Throne card pack that you can open once Knights of the Frozen Throne arrives. Northrend awaits! We’ll see you in the icy depths of Icecrown Citadel on August 11.